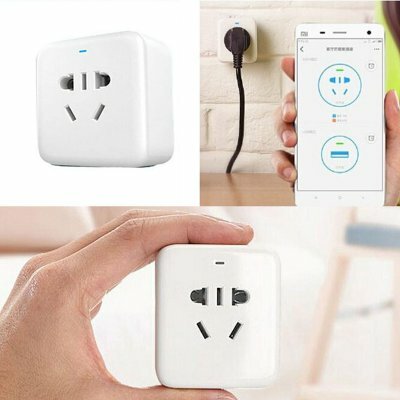 Successfully Added Xiaomi Mi Smart WiFi Socket - App Control, Overload Protection, Fire Resistant, AU Socket, Suitable For All Electronics to your Shopping Cart. With the Xiaomi Mi smart socket, you no longer have to worry about overcharging your electronics and all the associated potential fire risks. Simply place the Mi smart power plug in between the plug of your device and the power socket, and you’ll be all set to safely charge your electronics. As a true smart home appliance, this cool electronic gadget can be connected to your local WiFi network, enabling you to control it remotely through the Mi Smart Home mobile Application. From now on you’ll be able to enable and disabled the power supply to your electronics without you needed to be physically there – allowing you to head out with confidence while your laptop or tablet is charging at home without needing to worry about a thing. This smart home gadget furthermore allows you to set a certain charging time via its mobile application. With this feature, it allows you to charge your smartphone for several hours while you’re at sleep before the Xiaomi WiFi socket shuts itself down, hence taking away any fire-related risks. The mobile application has a straight forward design and is easy to use for young and old. It additionally lets you control other Xiaomi Smart Home systems, allowing you to create the ultimate smart home environment. Featuring a lightweight and extremely compact design, the Xiaomi WiFi socket can be easily carried along within your pocket – allowing you to use it at home, school, work, or during holidays. Its durable body is capable if withstanding up to 750C heat and is furthermore fire resistant, further increasing the overall safety of the device. Suitable to be used with any type of electronics out there, this smart home accessory is the perfect asset to any modern household out there. The Xiaomi Mi smart socket comes with a 12 months warranty, brought to you by the leader in electronic devices as well as wholesale electronic gadgets..